Since it is Valentines Day I thought it would be the perfect day to talk about love. I love Gennyral so much. I cannot even put into words how much my horse means to me. Being given Mexican General was a total dream come true. I always wanted my own horse and I just thought it was never going to happen. Gennyral has just always been my magical pony. When he was hurt a part of me died. I was so scared of loosing him. All these years later almost loosing him has made me even more grateful to have my special pony. I wish that all of you could have a horse as wonderful as my Gennyral. He is my perfect pony. One of the little things that I love so much is this little cluster of copper colored hair on his nose. 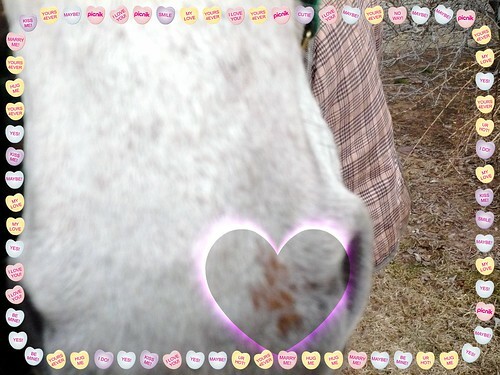 This little oddly shaped marking is in the perfect place for pony smooches. My little flea bitten guy is the only horse I have known to have such an odd placement of copper colored hairs. It is not as obvious with his summer coat so each fall as he starts to shed my heart warms a little knowing that his penny colored marking is going to really appear. It is small enough that most people do not notice it, but to me it is something that I just love so much. Just looking at that sweet muzzle makes me want to drive to the barn and give my pony more hugs. Is there anything little about your horse that you love that most other people do not even notice? And don’t you want to all meet Gen so you can smooch his special little marking!